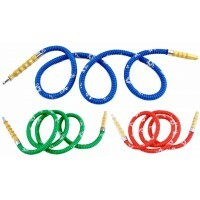 Zahrah Regular Hookah Hose Assortment. 62". 10ct. ..
Hookah Hose. Black. 6 Foot. 10ct. ..
Hookah Base Rubber Hard. 10ct. ..
Hookah Base Rubber Soft. 10ct. ..
Hookah Base D. 11.5". 1ct. ..
KM Nour Hookah Base Assortment. 11.5". 1ct. .. Ceramic Pan Hookah Bowl With Display. 12ct. ..
Coco Jamra 1kg Premium Hookah Charcoal. Coconut Charcoal Is Made From Coconut Shell. Burns 3 Times L..
Princess Sultan Hookah Diamond Collection 15299M. Includes solid colored vase, silver plated color s..
Princess Sultan Hookah Diamond Collection 15300M. Includes solid colored vase, silver plated color s..
1 Hose Illuminati Glass Cone Hookah. Assorted Color. 21". 1ct. ..
1 Hose Crystal Ball Hookah. Bases, Balls, Bowls And Hoses Come In Assorted Colors. 22". 1ct. ..
1H Infinity Hookah. 24". 1ct. ..
Zahrah 1 Hose Large Hookah. 24". 1ct. This large 1 hose hookah is about 24 inch in length with ex..